Yogurt selections like this one at a Los Angeles 365 by Whole Foods Market store are getting larger, but a new U.K. study warns that many contain lots of added sugar. Yogurts found in a U.S. supermarket have similar amounts of sugar to those found in U.K. stores. And experts say those sugars can add up quickly. If you look at the sugar content of some yogurts in the supermarket, you might mistakenly think you're in the dessert aisle. Yogurt is marketed as a healthy food, but a study published this week in the British Medical Journal is the latest reminder that not all yogurt is created equal. The researchers surveyed the sugar content of over 900 yogurts in U.K. supermarkets and found that the average amount of sugar across yogurt categories (children's, organic, flavored, etc.) was well above 10 grams per 100 gram serving. To receive a low-sugar label in the U.K., products cannot have more than 5 grams of sugar per 100 gram serving. Sugar accounted for the majority of total calories in all but natural or Greek yogurts. One finding of the study that might come as a surprise to consumers is that organic yogurts were some of the sweetest of all. The median sugar content for organic yogurts was 13.1 grams per 100 gram serving, and some brands had almost 17 grams of sugar per 100 gram serving. A source of probiotic cultures, protein, calcium, iodine, and vitamin B12,yogurt is frequently recommended as a part of a healthy diet. In fact, studies have shown yogurt consumers have a lower risk of obesity. So in 2017 when the U.K. government announced the top nine food categories after sodas, juices, and smoothies that contribute to children's sugar intake, and yogurt made the list, it took Dr. J. Bernadette Moore, an associate professor at the University of Leeds' School of Food Science and Nutrition, aback. As a mother she wondered, just how much sugar was she giving her daughter? "I discovered that for my young daughter's favorite yogurt, sugar accounted for 60 percent of the calories," Moore says. Moore suspects the amount of sugar in yogurt in the U.S. is about the same as in the U.K.
A quick trip down the yogurt aisle of a big U.S. supermarket chain in Los Angeles seems to bear this out. 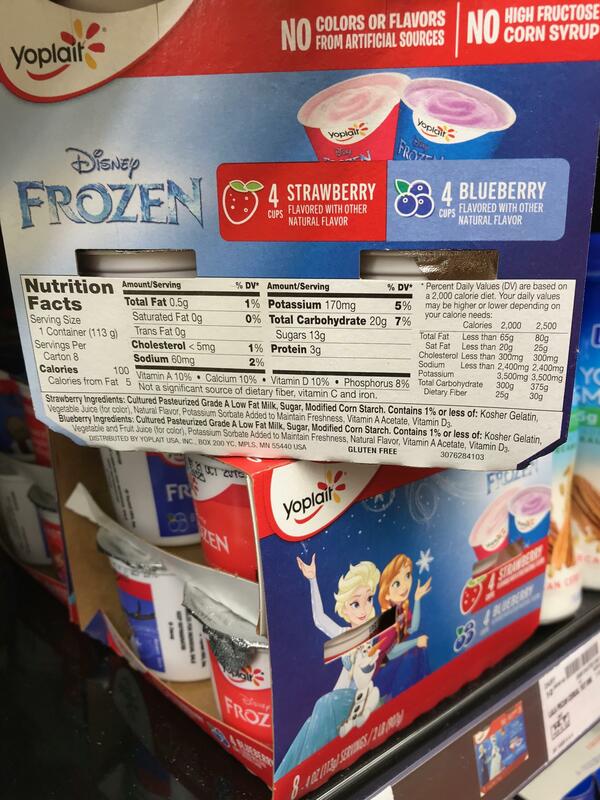 One Yoplait yogurt, marketed with Disney's popular Frozen characters on it, contains 13 grams of sugar in a 113 gram serving. Chobani Kids had 9 grams of sugar in a 99 gram serving. YoCrunch low-fat yogurt sported 12 grams of sugar in a 113 gram serving, but that number spikes up to 19 grams of sugar if you add the accompanying "mix-ins," like Oreo cookies or M&M candies. Yet, the halo effect of yogurt is powerful, and for Moore, this is perhaps the most significant implication of the study. "What is worrisome is that yogurt, as a perceived 'healthy food', may be an unrecognized source of free/added sugars in the diet," the researchers write. According to Lindsay Moyer, a Senior Nutritionist at the Center for Science in the Public Interest, consumers may get around 25 percent or more of the WHO's recommended daily sugar limit for adults (from 25 to 50 grams or less than 10 percent of total energy) from just one serving of yogurt. What is worrying, she says, is that people are often not aware just how much sugar they're consuming when they eat yogurt. Most dairy products contain a naturally occurring sugar — lactose — that is included in the total sugar count. That's less worrisome than added sugar. So how can you tell what kind of sugar you're getting? In Greek yogurts, there might be four to six grams of naturally occurring lactose and 8 to 10 grams in non-Greek yogurts. Anything above that is likely added sugar, Moyer says. 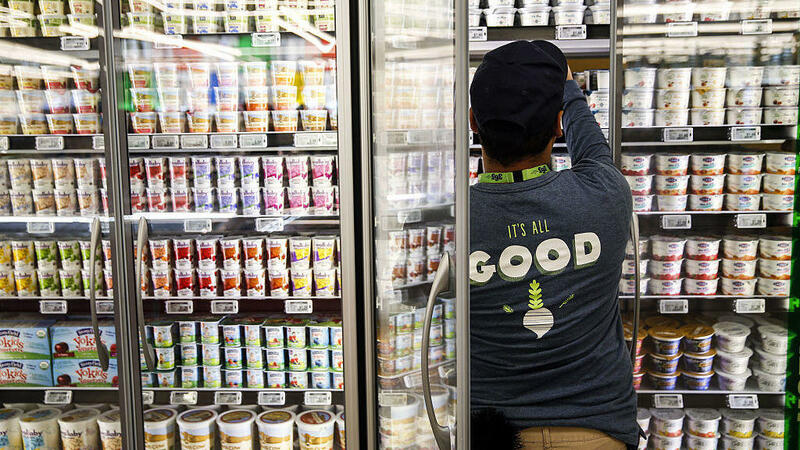 What may also help in the U.S. is that by January 2020, most companies will be required to use the Food and Drug Administration's new nutrition labels, which call out added sugars.The healthiest yogurts, Moyer and Moore agree, are plain, unsweetened yogurts and Greek yogurts. Moore's research prompted her to wean her daughter off of sugary, dessert-like yogurts. "We've switched to using natural yogurt and she sweetens it with jam," Moore says. She recognizes that jam, fruit, honey, and other popular yogurt toppings are sweet, but at least when you're adding them yourself, she says, you know roughly how much sugar you are consuming.